A Father For Christmas is the story of a little girl who wishes for a father for Christmas and then accidentally thinks that the stranger she has met under the Christmas tree is her father! I have read Rachelle Ayala's books in the past and enjoyed her writing style. 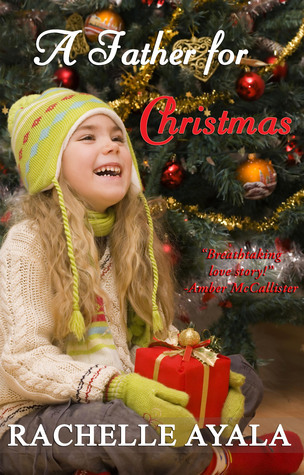 While all the previous books that I have read were based in Philippines, this one based in America and is a through and through holiday romance full of Christmas cheer and happiness! The cover is sweet and combines with the intriguing title and blurb had me picking up this book to read. Right from the start I enjoyed reading this book and simply adored young Bree and connected with her mother, Kelly who is single, going through a rough patch and still ready to do anything for her daughter. Tyler is a character who had me going misty eyed right from the start. His service as an army man to his country and then his determination to give everything he has to charity even if it meant living on the street had me rooting for him. The war flashes that he has often had me praying for his recovery from PTSD and then hoping for a happily-ever-after for him with Kelly. Both these characters are so suited for each other. Both are hurt, scared to give happiness and life another chance and then when they meet, it is like magic! Rachelle's writing style is engaging, realistic and had me interested in the story right till the end. She brings to life the plight and emotions of the characters so easily and had me feeling each and every emotion felt by the protagonists as if they were my own. All in all, A Father For Christmas is an entertaining book that I thoroughly enjoyed reading and recommend it all readers. 4 out of 5 to it from me. I look forward to reading more from the author in the future.